Perfect too what a beauty well done my friend. Ooh, that is so lovely Milky! Gorgeous Maureen and so much nicer with being a bargain too. Funny how the least expensive plants seem to be the best. The leaves look good too, do you give it ericaceous compost or is it in acid soil anyway. Dawn its in a 50/50 mix of soil and ericaceous.....I think our soil is a bit acid anyway......and Thanks Shirley.. This is seriously gorgeous lucky you. Very delicate colour. Nice that the frost hasn't got it. 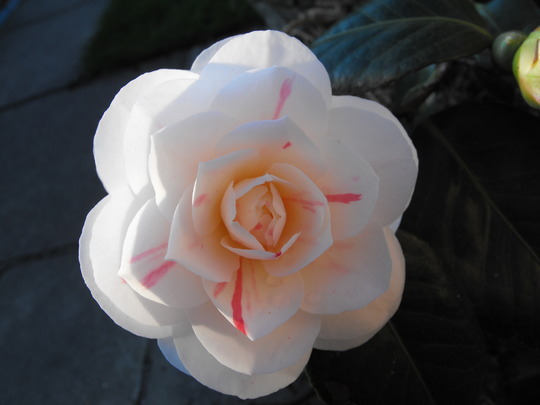 A friend of mine used to have two different camelias and the frost always turned the flowers brown. What a beauty and a bargain to boot!! A star bloom. Well done.